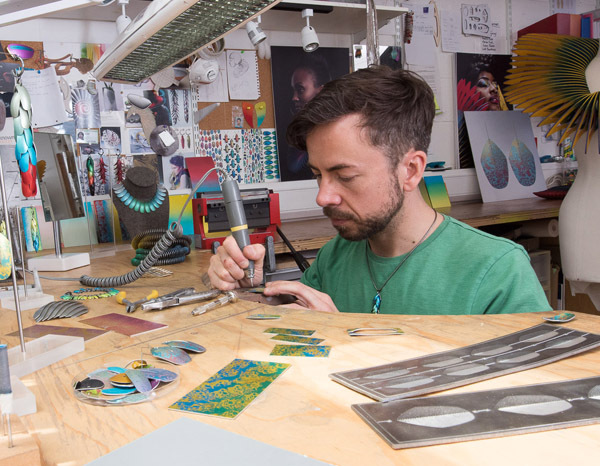 – John Moore tells us with the humble confidence of an artist who won the prestigious Goldsmith’s Company award in 2016 – the industry’s highest form of recognition. “It’s about paying homage to nature, celebrating it but in a way, which is honest to its construction and to yourself”. 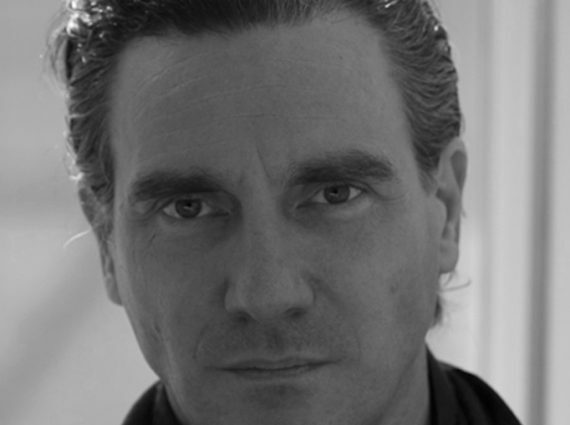 John’s ability to create pieces which draw inspiration from the living world yet stay truthful to his unique vision has earned him a cult following among jewellery collectors. The grande dame of wearable art Tuan Lee commissioned his first Verto necklace. Lady Helen Hamlyn, patron of the arts and founder of the The Royal College of Art’s Helen Hamlyn Centre for Design, is another energetic supporter of John Moore’s work. 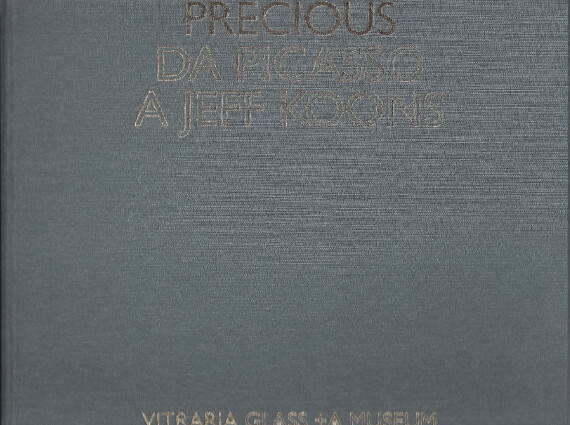 Last year’s prominent exhibition of contemporary jewellery, Bijoux Contemporains, Une Passion at Brussel’s BOZAR was followed by a beautiful catalogue; and John’s necklace notably graces the first page. At Elisabetta Cipriani Gallery we could not agree more with all the acclaim that John Moore’s work is receiving. Here, we offer you a glimpse into the magical headspace of this remarkable artist. 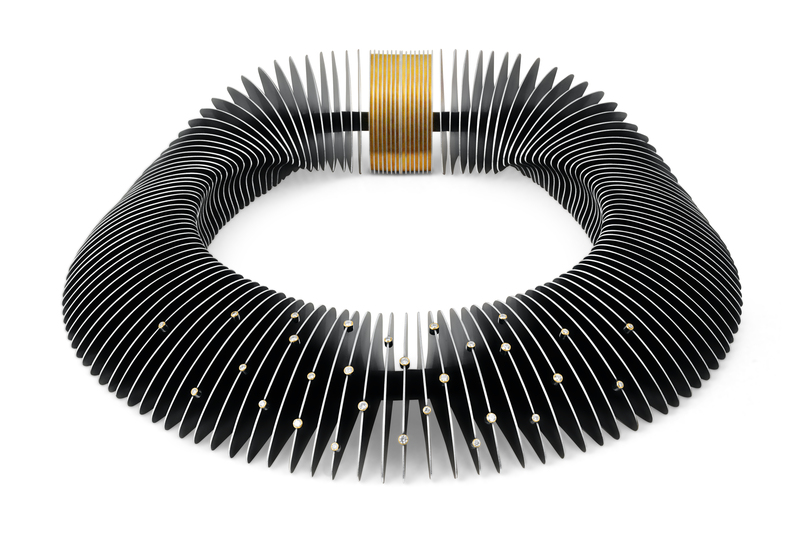 John Moore, Verto, necklace, 29 diamonds, 18 kt gold, sterling silver, steel, silicone rubber, magnets. Winner of Goldsmith Company’s award in 2016. EC: You mentioned to me once that while other children were playing with toys, you were busy making your own. Clearly from an early age you were creating a world according to your own vision. What world are you designing today and how has it evolved throughout the years from your childhood daydreaming? JM: “That’s a big one! I do envisage my pieces as part of a world but not necessarily part of the one we live in. It’s a place that I can visit in my imagination… and there are these beings, these special super humans that live there surrounded by beautiful nature and there is no war…” For a moment he shies away from his idealistic enthusiasm, and giggles calling himself a nut job. In reality, the artist’s aesthetic is informed by a joyful awareness of other artworks created by those who, similarly to him, dare to dream. EC: Indeed, your jewellery is incredibly powerfull. It’s a harmonious oxymoron. The Elytra Earrings, for example, brilliantly combine elements of futuristic sci-fi with nature-inspired tribal adornments. How do you marry together these, arguably, opposing ideas and aesthetics? 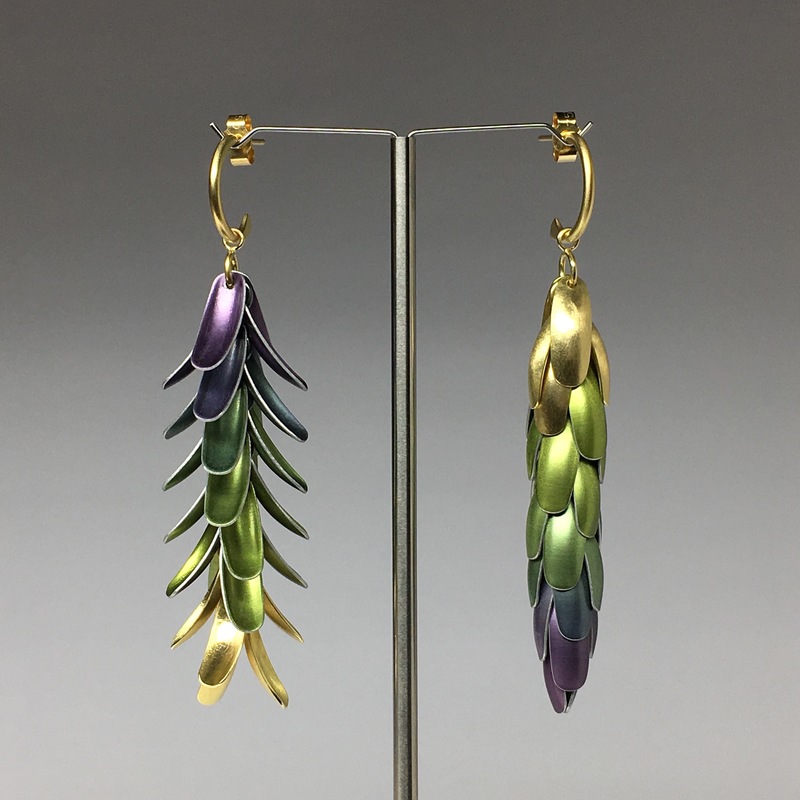 John Moore, Elytra, gold, purple, and green earrings (H 7 cm), 18 kt gold and aluminium. 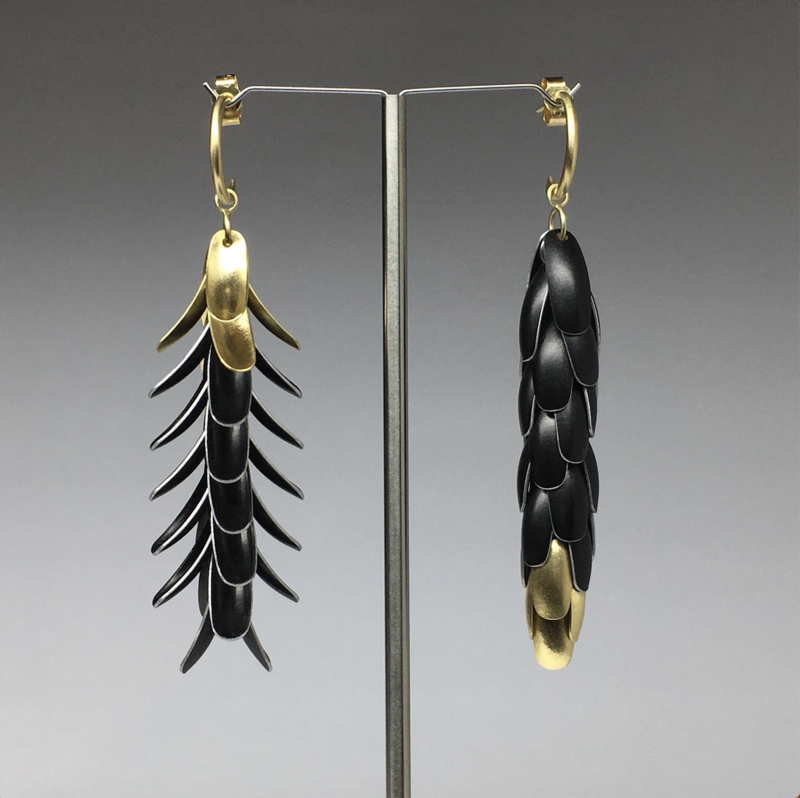 John Moore, Elytra, gold and black earrings (H 7 cm), 18 kt gold and aluminium. EC: The materials you use and how you put them together to create your vivacious jewellery is one of your great strengths. EC: Does it become more magical with movement because it becomes more real? JM: “A jewellery piece is an object that can dance. The wearer empowers it, like puppetry. It becomes this other thing, an extension of the body. Then in turn, it empowers the wearer. Wings and feathers are a big influence for me. You know the phrase to take you under my wing? Wings become a shelter and they give you the ability to fly. There are layers of meaning behind wings, and beetle wings are another recurring theme in my work because they provide armour and flight. With my jewellery, there is definitely an element of protecting the wearer”. 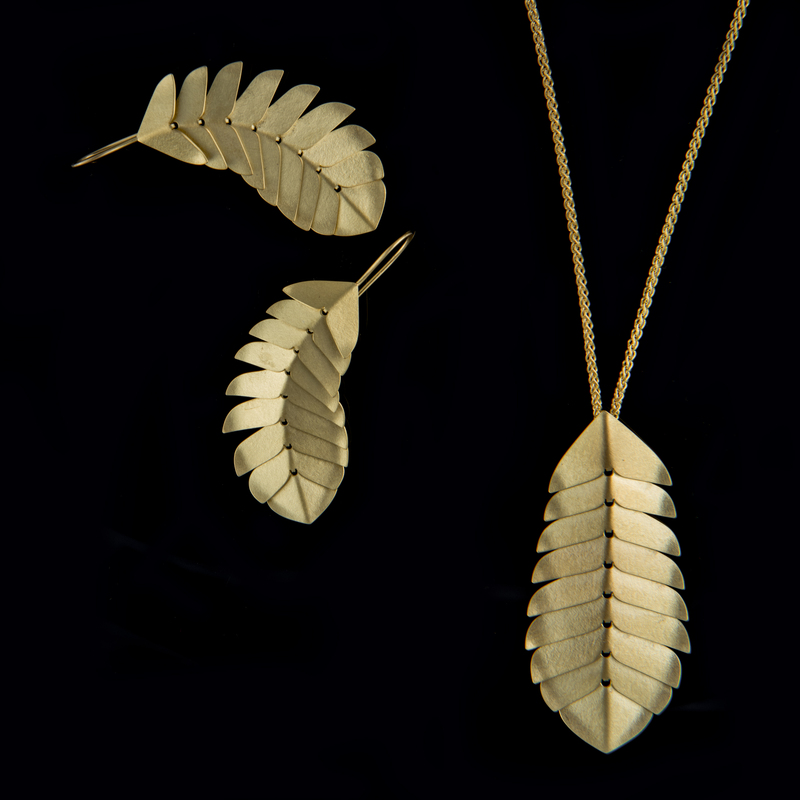 John Moore, Bromeliad, Pendant (H 6 cm) and Earrings (H 6.4cm), both 18 kt gold. Unique. EC: It would be interesting to learn more about those who wear your pieces – your collectors. Tuan Lee commissioned your first Verto Necklace. In an interview with the Financial Times newspaper, Ms. Lee shares her intimate story of reconnecting with the humankind through her statement jewellery, after initially being traumatised by high-school bullying. What was it like working with her? JM: “It makes me very happy to know that Tuan Lee feels empowered by my works and the works of other talented jewellers. One of the biggest powers jewellery gives to its wearer is self-expression. I think people lack ways to do that these days. I express myself through making my pieces and it’s heart-warming to know that there are people out there who resonate with my creations and see them as a means to express themselves. I am not trying to please everybody though. I think it is better to do something really strongly and for that to appeal to a smaller number of people”. EC: You have to please yourself, and then those who love you and understand you will follow. Do you have a specific wearer in mind when you create your jewellery? EC: When I receive new pieces in the Gallery, I always imagine them on people that I know – “this would look great on this person, and this on that person”. I immediately do that. I wanted to ask you actually about your unique presence in our Gallery. 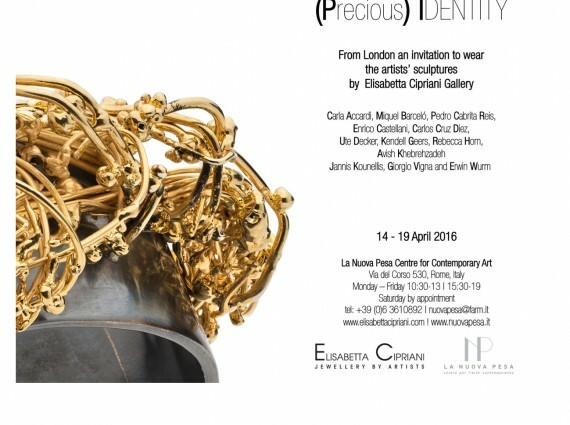 Most of the artists we represent have never done jewellery before collaborating with us. Why do you choose jewellery as your primary mode of expression? John Moore, Vane, blue, red, yellow, and green necklaces (65 cm), aluminium. Photograph by Pia Schweisser. EC: I also prefer art rooted in feeling. I was recently asked what type of art do I like – I said I like art that is connected to nature and also where everyday objects are present. So that somehow when I look at a piece of art, which can also be a jewel, it’s related to my everyday life. It’s more like a direct impact that I experience from the work. It’s the sensation that I have while I look at it, which pleases me; and what pleases me is what I am linked to. When it is political, conceptual… It is interesting, but it is cold. EC: Exactly. I have to follow a rigid selection of artist jewellery, in terms of my job. But then I see amazing artisans in Italy, who are not artists – they are artisans. And they work for other people to make their ideas come to life. Of course, they’re artists too. I think what is important is that the jewel has to protect the woman, give power to her. It has to be a piece that links you to other people through communication. When someone sees your jewellery and says – “wow look at this, it’s amazing!” – the piece starts a conversation, thus connecting people. It adds to your personality, enhances it. Well you have to have your own personality and then the jewel enhances it. Your pieces are definitely conversation starters. What are the projects that we should look forward to in the future? JM: “Lots of new designs in mind. More than my brain can cope with! This morning I had a meeting with a musical composer. Hopefully I will design pieces for a choir performance, in which the sounds will be visually represented through movement and objects. I am very excited to collaborate with other disciplines. I am looking forward to understanding more about myself through my work. I hope my work will become an opportunity for others to understand themselves better as well”. Artist Extraordinaire John Moore at work on his Brighton Studio. Photograph by Philip Traill. John’s visit to the Gallery left everyone here in uplifted spirits. An artist in the most joyous manifestation of the word, he sees the world not how it is – but how it should be. To see his magical art in person, please book an appointment to visit our gallery.